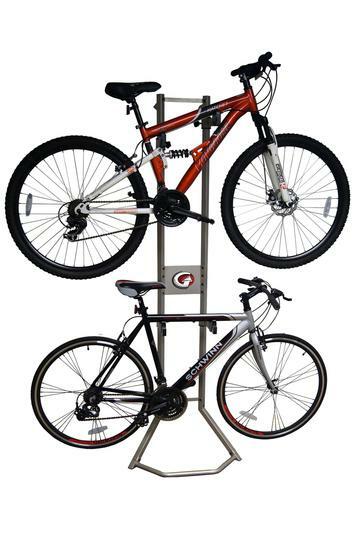 The Platinum 2 Bike Gravity Rack holds 2 bikes with a patent-pending arm assembly that offers 3 dimensions of adjustment to accommodate any style of bike. Heavy-duty powder coated steel tube construction resists scratches and rust and provides a strong dependable rack that has an industry best 120lb capacity. Overall height is 84". Rubber caps protect the wall and floor from unsightly marks. Specially designed rubber storage arms gently cradle your bike. Assembled dimensions 84" high, 30" wide, and 24" deep. Weighs 20 lbs.